It’s the summer of 2009. We’re in the middle of the credit crunch. My company has just been bailed out by the US Government. I’ve returned to work after 18 months away for breast cancer treatment. The morale in the office is at an all-time low. We’re going to be made redundant by the end of August. This will be my third redundancy in a career spanning 20 years in finance. What now? I am in my early forties and am in remission from cancer. I’ve only ever known the investment world. Who will hire me now in this period of utter chaos? More importantly, do I want to stay in the financial world? The answer is a big fat NO. I’ve had enough. I am sick of that world. But what else can I do? What else am I good for? Who will employ me at my age in a different industry without the necessary skills and experience? In the space of just two years, I went through two life-changing experiences – my breast cancer and the end of my financial career. Two experiences that made me reassess my life, my values, my priorities and face my fears head-on. Two experiences I didn’t ask for that made me take action despite all my resistance. Two experiences for which I am eternally grateful. Because without them, I wouldn’t be where I am today – doing what I love and living a meaningful life. Change has affected every single client I’ve worked with. A company takeover; a company merger; a promotion; redundancy; a new career opportunity; a company expansion. The common denominators for each of these situations? Globalisation and the English Language. ➣ The company’s been taken over by an international company or merged with one and from now on, the common language of business is English. ➣ Your company has expanded into the Asian markets and English is the preferred language of trade. ➣ You’ve been promoted to senior management and part of your role is welcoming international visitors to your offices and guess what? It has to be in English. ➣ You’ve been made redundant and you know the next job you apply for requires English – a language you’ve not needed to use regularly until now. 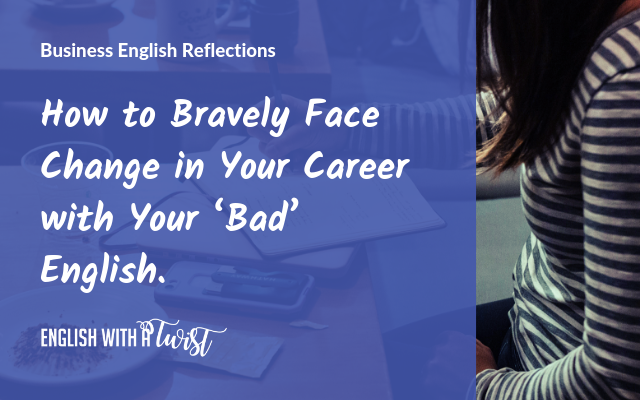 Suddenly everything you’ve known up to now has changed and you feel that your career now depends on your grasp of the English Language, not on your professional expertise and experience. Let me guess if you feel like my clients. Terrified, anxious, vulnerable? Wondering why you didn’t spend more time learning English? Feeling ashamed that your English doesn’t reflect your senior position? Wondering what now? Here’s what you do to try and solve the problem of your ‘bad’ English and the result. ➣ You join the company’s in-house classes, but soon drop out – you can’t see how talking about your holiday is going to help you in your next business production call. ➣ You buy an online course to learn to speak like a native speaker but never complete it. ➣ You buy a grammar book and work through those exercise sheets, but those rules don’t seem to stick. ➣ You book a full-immersion 2-week intensive course but months later, you’ve forgotten everything you’ve learned. You do all this because you “need to be grammar-perfect, have a wide vocabulary, acquire a neutral accent and above all, try to speak like a native speaker”. Why? Because that’s what you’ve always been told is the ideal level to aim for by every single teacher you’ve had. It’s the level you (and others) believe will bring you professional respect and recognition. Here’s the thing… this ideal level is not YOUR reality. Let’s pause and consider your business reality. If you’re like my clients, your reality looks something like this. Reality #1: Your co-workers, clients, suppliers are predominantly international speakers. In your new globalised world, you find yourself mixing with a wide range of international speakers of English. All with their ‘own’ English – mixed-up grammar, made up vocabulary, simple sentence structures, varying levels of fluency, rich accents (some easier than others). International speakers who are forgiving of each other’s grammar mistakes, adjust their accents, muddle through the confusing vocabulary, and adapt to each other’s accents. International speakers who don’t need you to achieve an impossible standard of English to do business with them. Occasionally, you may have to deal with the monolingual English speaker (the so-called native speaker) and they too have their ‘own’ English – Irish, Scottish, South African, Australian and so on. But they are a minority. Don’t allow them to dictate how you communicate in English. Click here on how to handle them. You don’t need to talk about your hobbies, your next holiday or what you did at the weekend in English. You’re not paid to talk. You’re paid to do your job. You’re paid to deliver a business outcome – securing that deal, getting that sales order, presenting your proposal to the board, motivating your international team to achieve their targets…(fill in the blanks). Your need is specific which requires focus and preparation. It doesn’t need better grammar, more sophisticated words, a neutral accent in English. It requires you to learn to communicate, NOT speak more. You can learn to communicate successfully with the English you already have. Here’s how you know you’re communicating to achieve your business outcome without resorting to more English grammar and vocabulary. Whether it’s a meeting, a conference call, a presentation, a phone call, you do this. ➣ Start from where you are >> use the language you already have >> you’ll be surprised by how much English you already know. ➣ Think of your audience >> Who are they? >> Are they international speakers? >> What’s their level of English? >> What information do they need from you to achieve your outcome? ➣ Speak your audience’s language >> adapt your language to theirs >> use common words >> use words that mean something to your audience. ➣ Be prepared to listen first >> to understand >> to empathise >> to forge a meaningful relationship. ➣ Ask questions, sit back and listen >> put your audience centre stage and be prepared to learn from them. ➣ Give yourself breathing space >> by listening more and allowing pauses, you give yourself much-needed ‘white space’ to think >> this brings clarity and direction >> It also shows you’re a thinker. Change can be terrifying, but it can also be the best thing to happen to you (It was for me). You can resist it or plunge in head first. But whatever you decide, don’t make your ‘bad’ English the reason you don’t chase your professional dreams. That would be such a waste of talent. Instead, focus on learning how to communicate with the English you already have. Hi Shanthi, a very inspiring post and well focused. I love your key message, which works equally for non native and native English speaking professionals, “learn to communicate, NOT speak more”. Your blog is one of the best Business English blogs out there. Thank you ever so much. I am so pleased my post resonates with you. I am passionate about my core message and yes, we ALL need to learn to communicate better.